The mood at Davos 2019 was the most uncertain in years. Trade tensions between the US and China, slowing global growth, the backlash against big tech, volatile markets and political standoffs are sowing seeds of doubt with investors and business leaders. It’s a long way from the heady exuberance of last year. Conversation was dominated not only by who was there, but by who was not. Numerous political leaders stayed at home. One investor argued we are seeing the biggest political and policy uncertainty since the 1970s. Behind the scenes, I found three big themes with special relevance to finance. Artificial intelligence (AI) has replaced blockchain as the big conversation for executives, second only to US-China trade. There were 11 public sessions on AI, the most of any topic. Eighty-five percent of chief executives thought that AI and machine learning from huge data sets would dramatically change their business over the next five years, according to a PwC report. 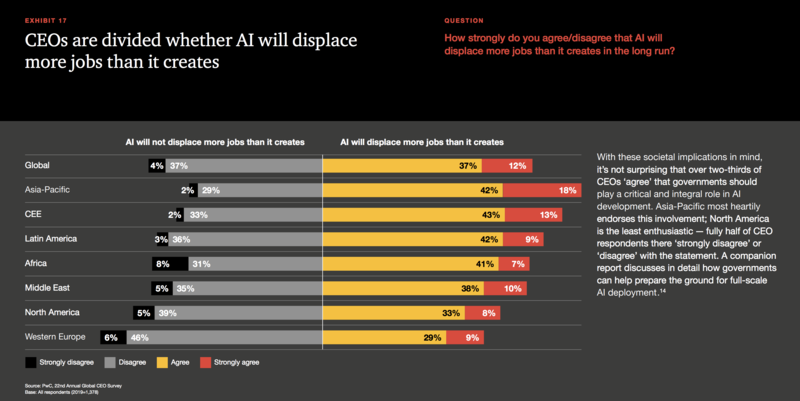 But when asked if AI will displace more jobs than it creates, CEOs sat on the fence: 49% think yes, 41% no and 10% don’t know. Whether China was on track to surpass the US in AI development was also a big debate. Blackstone CEO Steve Schwarzman and AI Superpowers author Kai-Fu Lee both thought it likely. One of the liveliest discussions I attended was a closed-door session on the ethics of AI in financial services. We debated a framework so that decisions made by AI are explainable, transparent and fair to consumers. While there was broad agreement on the principles, there was less on the detail. One professor argued that AI should probably be held to an even higher standard than humans, given these tools are often learning from incomplete or already biased data sets, or because when things go wrong the size and impact can be catastrophic. The bottom line is this: if companies don’t shape their own “ethical” standards, they are likely to have them thrust upon them. There has been a sea change in recent years at Davos around the perceived threat from new tech-enabled models to impact banks’ profits. Bankers - and some policy-makers - worry that new entrants could undercut banks' profits and leave banks exposed with expensive legacy costs. The battle between every start-up and financial institution comes down to whether the former gets distribution before the incumbent gets innovation. The largest global banks at Davos are dramatically upping their game on digital transformation spending and cyber defences. Little wonder that many of the fintechs that haven’t yet got scale are now looking to partner instead of trying to be disruptors. But the speed of growth and size of some of the new firms is giving bankers pause for thought. In China, leading platforms have already moved into banking and insurance at scale. Chinese payment firm Ant Financial just passed one billion customers - five times more than Citigroup. It’s the threat from large platforms becoming more active in financial services that keeps the finance bosses at Davos on their toes. While many delegates were starstruck by Sir David Attenborough, I was encouraged by how some leading investors were taking practical steps to make sustainable investing mainstream. TPG announced at Davos that it is going to share the toolkit it has created to measure the impact of its sustainable investments through spinning out Y Analytics, while Refinitiv announced a new initiative to help corporates benchmark their actions. Six hundred companies, representing $100 trillion of assets, have now agreed to publish their climate-related risks along the Task Force on Climate-related Financial Disclosures (TCFD) metrics. Meanwhile, Blackrock hosted a lively debate on the shift in its investment stance from “why?” to “why not?”. As every investor knows, if you can't measure it, you can't risk-manage it. There is still much hard work ahead to shape better, more useful and more sustainable metrics for making decisions, but the direction of travel is encouraging. This year's downbeat mood could be a good sign, as the Davos consensus tends to be quite a reliable contrary indicator. But it also reflects genuine vulnerabilities. One CEO of a US bank told me that he couldn’t see anything in his clients' activity that suggests a meaningful slowdown; nevertheless, he thought there was an even chance of a recession in 2020. In 2017, I returned from Davos arguing that investing in Western markets may start to have more in common with investing in emerging markets, where you need a keen focus on country risks, political economy, trade policies and currency volatility. If we are investing in a more “uncertain" world, then the emerging market toolkit, alongside an understanding of how technology is reshaping societies and markets, may still be a useful guide. Huw van Steenis is Senior Adviser to the Governor of the Bank of England and a member of the World Economic Forum's Global Future Council on Financial Services. He writes in a personal capacity. This piece originally appeared in Financial News on 28 January, 2019.